VOC abatement is clearly explained as the direct decomposition of the organic substances spread in the air, which can be tested and experimented by measuring the organic substances concentration suspended in the air. On the other hand, Deodorization is considered as the odor organic substances which stuck on the other substrates, where odor is slowly emitted out of; Not directly be tested as the substance concentration in the atmosphere. This makes it difficult determining any experimental protocol with measurement. Data below is to show as evidence; this indicates the Acetaldehyde decomposition as one of the major smell out of over 100 kinds cigarette smells. Comparing with non coated Stainless Steel plate, the coated plate shows distinctly higher smell removal rate. 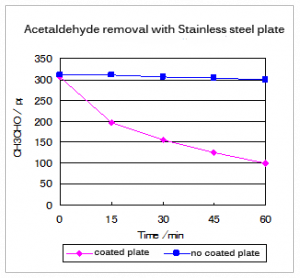 This experiment shows even 50mm x 50mm small sized coated steel plate installed in a 300ml gas bag could effect the high concentration Acetaldehyde as a load. 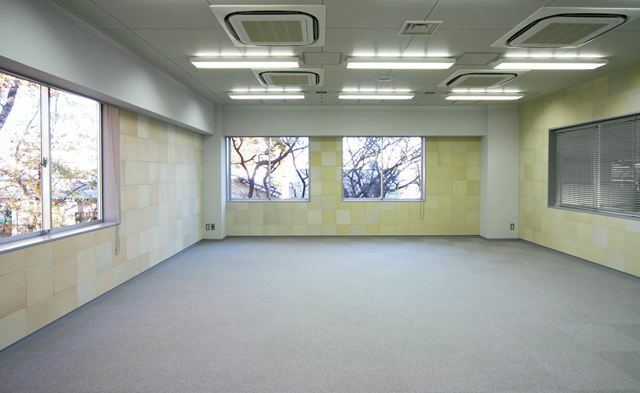 Ceiling, Walls are made as Photocatlyst applied construction interior boards.